As we all know that more and more citizens suffer from the bad hazy weather which can be harmful to people's body health in different degrees. The factors of this phenomenon are complicated and except wearing mouth-muffle when we are outside, there is no useful solution for us to get away from it. However, we can create a clean environment without smoke for our own house to live comfortably. 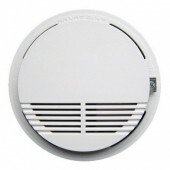 In that case you may need to use this independent smoke detector with high sensitivity from www.detectorall.com . With the improvement of people's living standard, the types of people's entertainment in their spare time are in variety. Many people like to hold parties in the different names to get friends and colleagues together to dance, chat and just for fun. It is a common sense that the more the better, the more joints the party will be livelier. Nevertheless we may ignore the potential safety hazard in the public occasions such as the smoke which may cause a fire accident. That can be dangerous and threaten to people’s lives if it goes worse still. We need to find a way to avoid the tragedy and offer a guaranty to ourselves. This smoke detector can be a very convenient home security device which can be used in any room of your house especially for the kitchen. It owns high sensitivity that can interconnect up to alarm, so when the smoke density reaches the limited standard it will send wireless signal to alarm panel and gives out an alarm warning letting you pay attention to the situation. No matter what are you doing, when you hear the alarm warning you can get know what happened and take actions timely to deal with the incident. With a connector plug, it is easy for you to install the alarm when you start to use the independent smoke detector. And also there is a built-in sounder to give a minimum sound output of 85 dB at 3 m senses smoke using the light scatter. Besides, the detector with high sensitivity can also play an important role in the non-smoking places such as railway station, theatre, hospital, library and non-fire places like petrol stations and gas stations. The secondhand smoke is harmful to people’s health and will cause lung cancer inevitably. But it is difficult to exhort the heavy smokers to stop smoking even in the public conditions. With the help of the sound alarm of this detector, it can act as a good reminder to warn the smokers thus to create environmentally friendly condition for other people to stay. Since the smoke detector can be used widely and help a lot in people's daily life, it is easy for the user to find such one product in the market. But if you want to find complete types of similar detectors, you should visit the specific online stores to pick up the right one for your unique use. Believe it or not, our store will not let you disappointed with a wide collection of detectors which can be used in different fields.